Industrial Battery has the shop capabilities to bring your battery back to life. Our reconditioning and repair process includes acid adjusting battery cells back to the manufacturer’s specifications, breaking up sulfation crystals formed on cell plates with our constant current chargers, and replace cells that don’t meet capacity. 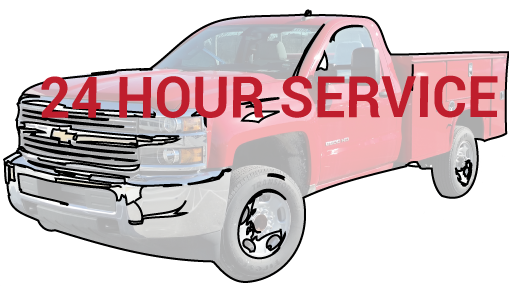 While we perform this process, we provide a loaner battery to keep your truck up and running. Final steps of this process include cleaning and neutralizing acid and corrosion buildup along with painting your battery to make it look good as new. Connectors broken? Cables cut or frayed? Watering system issue? Charger not working? Batteries need cleaning? 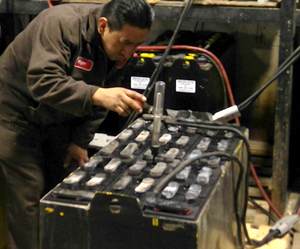 Industrial Battery has repair technicians able to perform these repairs at your facility. Service techs carry most common charger parts, watering system parts and accessories along with new cables and connectors to get you back up and running. Our service techs have over 40 years of combined experience and are able to get to your facility the same day. Preventative maintenance programs are available to help elimintate down time. These programs are performed annually, semi annually and quarterly depending on your companies usage and size of fleet. 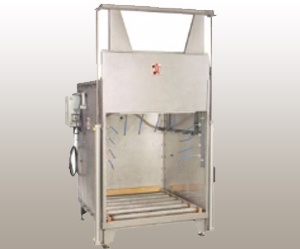 If the need arises to have batteries cleaned, we have a mobile wash unit that can be brought on site. Our green formula battery cleaner neutralizes acid and removes corrosion. All water used is contained and waste water is removed form your site for further neutralization and disposal.